Dr. Brady is a criminologist and California licensed forensic psychologist. He has written five books on addictions and as a celebrity analyst he strongly supports the position that some rich and famous celebrities steal because they are they are addicted to the thrill of it. 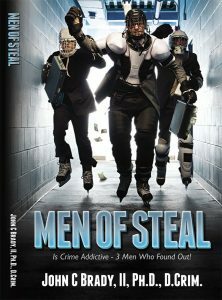 His books include: Men of Steal (a complete analysis of the three men in this article) and Treat Me Right- Help For Behavioral Addictions Including Theft/Fraud Crimes. He also devotes his professional time to helping criminal defendants who have been falsely charged and convicted of crimes they didn’t commit. John Spano who is a main character in Dr. Brady’s new book, Men of Steal, sits in an Ohio prison cell (10 year sentence) for a crime he probably didn’t originate. He is joined by thousands of additional prisoners who were psychologically coerced into making false guilty pleas. His story demonstrates a huge flaw in America’s criminal justice system. His full story is presented in Men of Steal that will be available soon. Your comments concerning his plight or other victims trapped in an unfair system are welcome. Celebrity offenders must figure out why they steal or face jail! Psychological analysis reveal they aren’t greedy—they are addicted to the “rush” associated with theft. They need therapy but will they see “the light” because this could be the end of the road? An in depth analysis of celebrity theft-addiction has not previously been addressed in a true crime book. Dr. Brady’s new book isn’t a “who dunit” mystery but it is a “Why they dunit!” The book features three special celebrity cases Dr. Brady has already analyzed and written about in his new book. Men of Steal: Is Crime Addictive? This is the third book in Dr. Brady’s ‘Bad Actor’s’ series devoted to gaining new insight and a better understanding of why women continue to steal and why they do not improve when using psychiatric drugs. In fact, many of them get worse! The first book, ‘Why Rich Women Shoplift’ examines the case histories of wealthy female shoplifters who, despite seemingly having it all, make the self-defeating decision to steal. 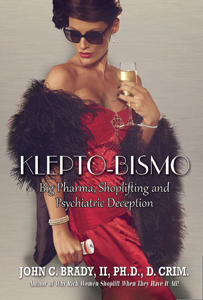 This book focuses on women shoplifters and their dependence of unnecessary psychiatric drugs. The collusion between Big Pharma and psychiatry helps foster a state of shoplifter learned helplessness. This is the second book in Dr. Brady’s ‘Bad Actor’s’ series, and provides a unique and “non-psycho babble” view, and insights into the twisting, convoluted, sad and devastating world of the woman shoplifter whose negative thefts can, sometimes lead to jail time, even for the “rich and famous.” This book, written by a criminologist and California licensed forensic psychologist, answers questions about why well-off women in society, including the celebrities we all read about, choose to steal, when they know it’s not in their best interest and many times ruins their professional careers and lives. Most importantly, Dr. Brady emphasizes, “It’s not about the stuff,” nor is it need or greed that drives them. Why Rich Women Shoplift - When They Have It All! This is the fourth book in Dr. Brady’s ‘Bad Actor’s’ series. People are mesmerized with” the rich and famous” especially when they take a fall or two. Winona Ryder, as a case in point, stole lots of stuff, but did she receive the necessary diagnosis and treatment she needed? Dr. Brady has analyzed many celebrity theft cases and concludes that, “most of these people never got the necessary help they needed, thus the bad news—they may re-offend.” Often the treatment of a behavioral, addictive disorder like stealing proves ineffective. He presents the cases of six psychologically troubled theft-addicts who he personally treated using a variety of therapies. This is the first book in Dr. Brady’s Bad Actor’s Series. This book deals with institutionalized drug offenders committed to the California Rehabilitation Center, CRC in Southern California. During the 1920’s this correctional facility was a health spa catering to some of Hollywood’s biggest motion picture stars. The “rich and famous” frequented the resort to use the natural sulfur springs and to just get away from it all. Later the State of California purchased the property converting it to a drug treatment center. Caught in a Trap tells the stories of twelve remarkable women who through no fault of their own became enmeshed in the uneven world of psychiatry and psychiatric medications. Each woman presents a unique point of view as to what happened leading up to her psychiatric referral. I’m sure each doctor has an explanation why they were medicated using powerful and mostly ineffective psychoactive drugs to treat sometimes even minor legal-social-psychological issues (e.g., shoplifting). Perhaps the negative outcomes including psychiatric hospitalizations weren’t intentional but that’s where, for instance, Barbara Gordon, an award-winning TV producer and writer, ended up. 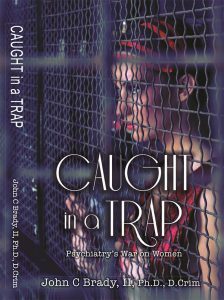 In Caught in a Trap Dr. Brady argues that psychiatric medications are not the answer to women that steal.